What we have here is a failure to eradicate. ⦁ Live bugs found after a heat treatment survived the treatment or were reintroduced. ⦁ Making sure the occupants are prepared, and then properly managing the heat, will avoid most “failed” heat treatments. Ideally, there will be no bugs seen once the treatment is completed, but it is not uncommon for a few bugs to be found. Let’s look at the list of reasons this might happen, along with steps that can be taken to prevent them. 1. Occupants carried bugs out with them and brought them right back in after the treatment was completed. We can refer to these as “lightening reintroductions” because they happen so quickly. This is usually the result of a heavy infestation combined with incomplete preparation. We must ensure occupants understand what they are to do the day of the treatment and that they have the means or support to do it. In heavily infested homes, the occupants need to have new or freshly laundered clothing stored in an impervious container to put on while they vacate for treatment. They may have walkers, wheelchairs, or scooters that are infested. These should be inspected and de-infested. This can be done by providing clean equipment to use during that day or by de-infesting the equipment at an alternate location during the treatment. 2. An occupant for work or social reasons regularly visits an infested environment and brings bugs home. For heavy and long-standing infestations, occupants may visit friends, relatives or other places regularly. These places might have become infested in previous months, and now serve as a reservoir to re-infest the freshly treated home. These reservoirs must be identified before the treatment. 3. A visitor to the unit brings in bed bugs on their person. Anyone who lives in, works in, or regularly visits a heavy infestation can unknowingly transport bed bugs. 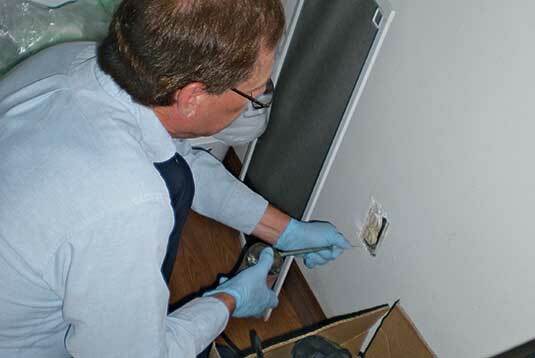 We, as pest management professionals (PMPs), carry out bed bugs after we visit heavy infestations. In communities with lots of bed bug activity, any number of visitors may be bringing in bugs. Even maintenance personnel might be carrying bed bugs. 4. Dispersing bugs that crawled in from a heavily infested nearby unit. As stated in Section 9.9 of the Best Management Practices from the National Pest Management Association, adjacent units should always be inspected. It is common while doing so, to find even heavier infestations that have remained unreported. Remember, with condominiums, poorly written bylaws might not allow the inspection of adjacent units without the co-owners’ consent. 5. The bugs were harboring in a protected area of the unit, and were never exposed to lethal temperatures. Heat treatments are complex operations that require numerous factors to be addressed to expose all areas harboring live bugs to lethal temperatures. This can be problematic for treatments made during cold weather or in buildings constructed of concrete, for example. High winds in poorly sealed buildings might cause an airflow driven by exterior winds called the “stack” or the “chimney effect,” whereby hot air is sucked out of a building the way a chimney works to vent a fireplace. This phenomenon can be found using an infrared camera. An infrared gun has only one sensor and may miss the heat leak entirely. Bugs in low-lying insulated areas or wall voids can remain cool if airflow is not managed through the proper use of fans. The longer the treatment is held after achieving lethal temperatures, however, the less likely these situations are to occur. There is always a concern by PMPs for bugs harboring in walls, but the proper use of fans for airflow, confirmed with temperature sensors and infrared cameras, can help identify these hazards. 6. There were never any bed bugs; these are bat bugs or one of the other lookalike species. Bat bugs and others in chimneys or attics can reach high populations that disperse into the living space. These bugs are easily misidentified as bed bugs by the untrained eye or by an overly casual inspection from a professional. In an area with heavy bed bug activity, any bug that looks like a bed bug might be assumed to be a bed bug. These situations are characterized by bugs found on exterior walls and around windows. 7. The bugs were exposed to lethal temperatures, but not high or long enough to cause immediate death. This has been referred to as “dead bug walking.” Although the phenomenon can occur regularly, it is unwise to offer this as the only explanation for a live bug found after a treatment. It is one of many possibilities and, unless the bug is clearly “on borrowed time,” the other explanations should be considered more likely. This is even more important several days post-treatment. Bed bugs prefer harborage that has had previous bed bug activity. It is normal for an introduced bug to find its way to the site of an old infestation. When we find a live bug sitting in what used to be heavy activity, we can easily assume that it has always been there — even when that is not the case. Heat treatments are truly a force multiplier in the fight against bed bugs, but the hazards listed here can frustrate a heat treatment crew. Careful planning can help avoid most of these pitfalls.